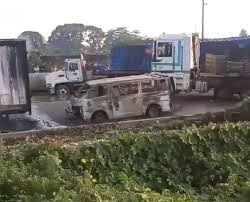 A fuel tanker explosion has been reported in Lagos Badagry Expressway on Tuesday morning. Casualty has not been ascertained, but unconfirmed reports say four tankers were involved in the accident and many commercial buses went up in flames. Eyewitnesses have taken to twitter to report the incident which is said to have occurred at 5.32 am at Barracks bus stop in Ojo.